How many times have you gone down a #bridalbeauty rabbit hole on Instagram to pick up some pointers for your own big day hairdo? 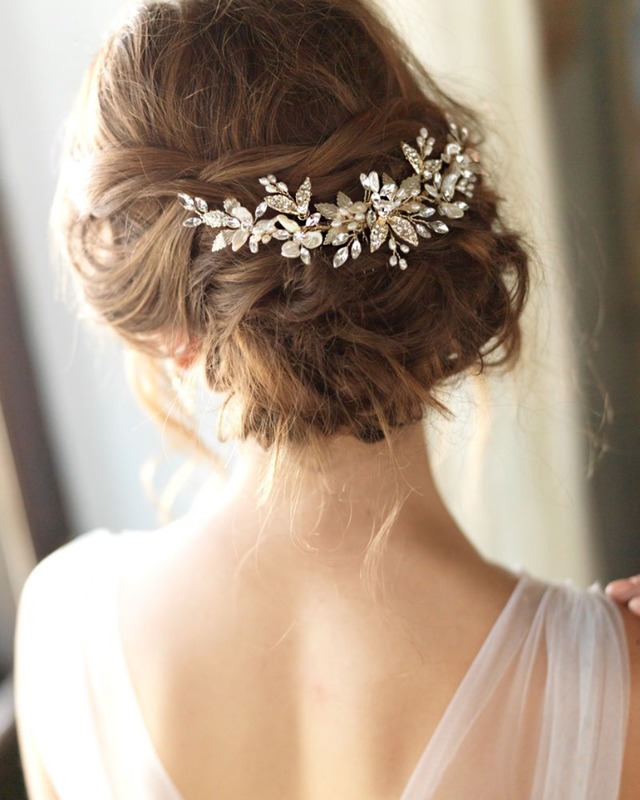 Or even more specific, #bridalhair, which turns up nearly 2 million posts. There is so much inspo out there, whether you want to go to go low and loose, high and tight or somewhere in between. It’s tough to commit to a look you know you’ll love, because every day, you have more options to consider. 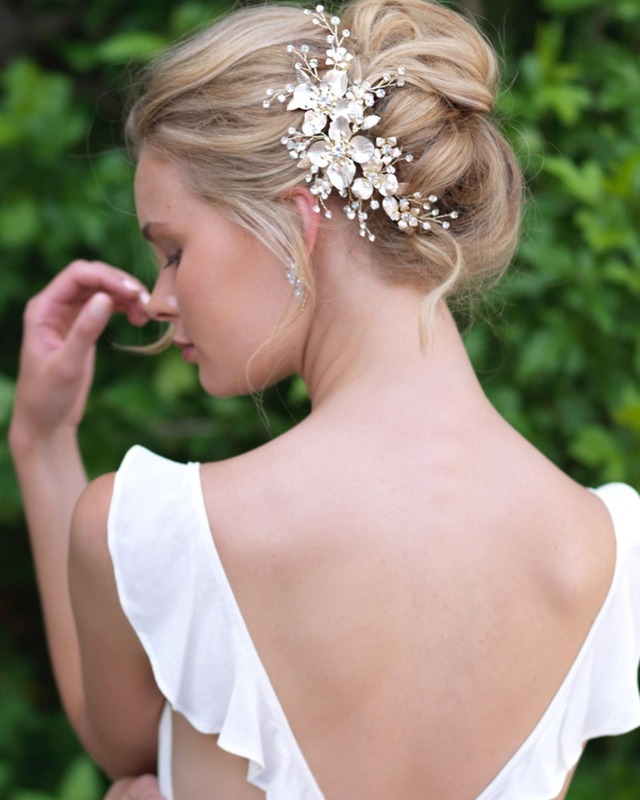 That being said, what has never been clearer is just how amazing headpieces can be for your wedding day hairstyle. And no, we’re not just talking about floral crowns, which we honestly could use a mini break from RN (absence makes the heart grow fonder, right?). From beautiful floral-designed tiaras and delicate, gold-leafed hair pins, to combs hand-crafted with rhinestones, freshwater pearls & keshi pearls, these accessories give your coiff all the appliqué you and your dress deserve. We caught up with a newcomer in the headpiece world, and we needed to tell you allllll about it, as soon as possible, because her collection is 🙌🙌 🙌. Dareth Colburn Bridal Collection embodies the essence of artistry, nature and beauty in every piece. With an unrivaled passion for design and a fervent spirit, Dareth (whose name we kind of want to steal, btw) began her signature bridal collection in 2017. Each piece is hand-crafted with precision, care and blushing brides in mind. Ethereal elements are combined with fine materials to create exquisite designs that are adored by brides across the globe and ship from offices in Beverly, MA. And here are the trends she thinks will kill this year + a few ideas on what celebrity brides-to-be could totally rock the looks. Have your hair girl’s number keyed up on your phone? She’ll need some practice making these pieces pop, so it wouldn’t be the worst thing in the world if you got your accessories ASAP. Here, we’ll help: use code WEDDINGCHICKS at checkout (doesn’t expire, either!) for 20% off. The days of cookie-cutter perfection are being replaced with high-fashion elements and designs. The Aviana Wedding Back Comb (available in gold and silver) features a bold botanical design unlike any other. Sophie T, we love this for you and your Sansa Stark-style. Ideal for undone updos or loose wavy curls, nature-inspired elements will be the perfect finishing touch to your bridal look. Take the Chloe Side Comb (available in gold and silver), which combines organic-inspired elements to offer a lustrous accent for your bridal hairstyle. Chloe meet Kaley Cuoco, we think you’re a match for this blonde bombshell bride. From champagne gold to rose gold and even brushed-ivory gold, there will be no shortage of golden hues for the 2018 bride. The Ava Floral Bridal Tiara is available in 14-karat gold and rose gold, both of which are accented with brushed-ivory petals, offering dimension and luminosity to these metallic finishes. Paris Hilton, here’s something to tickle you pink, it’s got royalty written all over it! follow dareth colburn on ig for all the headpiece magic!